For everyone who is traveling this week … you have picked a wonderful time to travel to the tulips and the flower fields! The last couple of days it was very busy at the Keukenhof. The first layer of flowers is in full bloom. And that makes that the Keukenhof looks beautiful so early in April. Last year we had the first layer of flowers in bloom at the end of April, beginning of May. At this moment inside the Keukenhof everything is in bloom or starts to bloom. They use the lasagna technique where the flower bulbs are planted in three layers. The top layer is in bloom now, the second layer will bloom in a couple of weeks and after that the third and last layer is in bloom. When visiting this week you will find daffodils, tulips and hyacinths in bloom. The crocus is almost gone, you might find a couple of them. The indoor flower exhibition will last maybe just one more week before it will turn down into another exhibition. Don’t worry outside you will find lots of tulips as well. And if you like Orchids please visit the Beatrix Paviljon for 100’s of different varieties. Outside Keukenhof in the flower fields you won’t find any crocus anymore. Most daffodil fields are at its peak or just over the peak blooming and turning to brown again. Every where you can see the white, pink and purple of the hyacinths and the fields with tulips in bloom are growing every day. If you see a red colored field you can be sure those are tulips, but you can see the pink and yellow too. 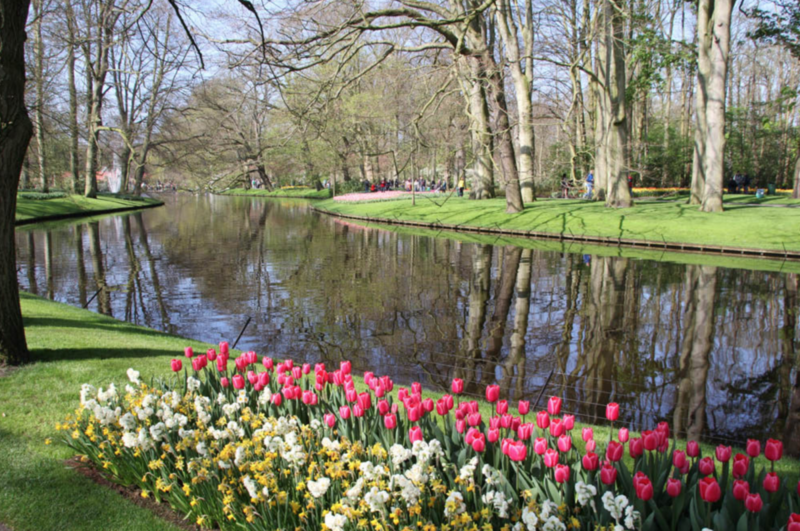 Upcoming weekend (weekend of 11 – 13 april) it is Dutch Flower weekend at the Keukenhof. At the summer bulb market, you can find out all about summer bulbs and plants directly from the grower. And Dutch gardner Rob Verlinden (known from TV) will give presentations about plants and flowers. If you are planning to buy spring bulbs please order them from the different companies inside Keukenhof and don’t buy the bulbs in the shops along the roads. The bulbs you can buy along the roads are from last year (old Bulbs!) The fresh spring flower bulbs are harvested this summer and will find their way all over the world from the end of this summer. (Well in time for you to plant them in October and november). Have a look at the photos of this week here. And if you are planning to visit the flower fields i’ve made a map for driving around. Have a great week and if you have any questions please let me know.